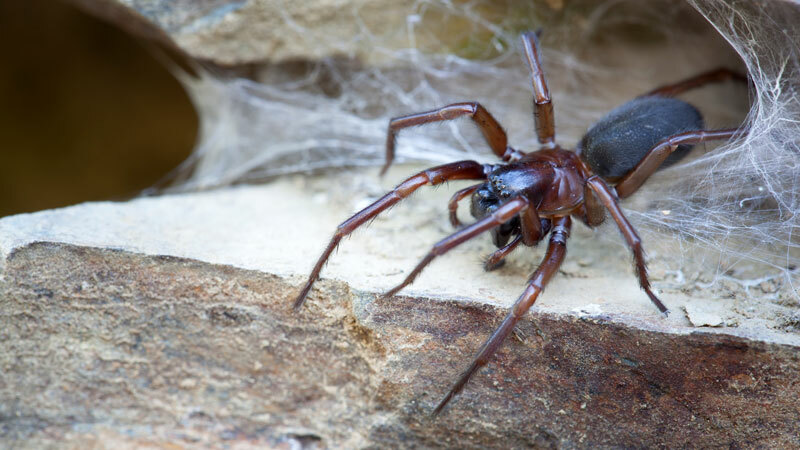 9 Most Common House Spiders: Harmless or Burn Down the House? “Step into my parlour,” said the spider to the fly. Unfortunately for you, this spider’s parlour happens to be your living room. Most common house spiders will set up shop where food’s available, and can become unwanted guests – especially come winter. Some species are harmless to humans and will generally stay out of the way, but others can be highly poisonous. 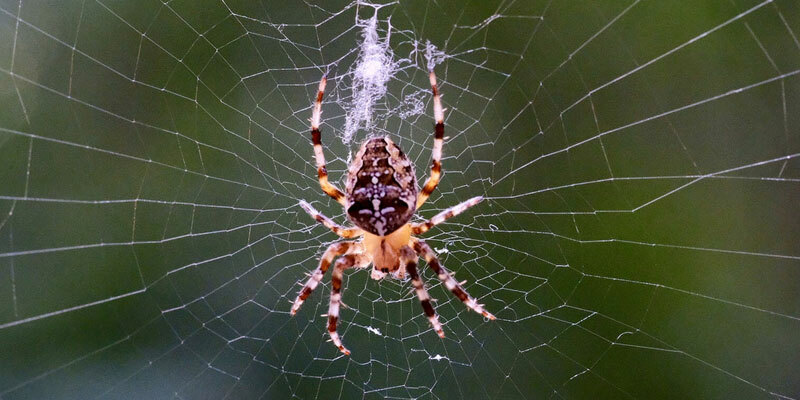 Spider bites can also cause a histamine reaction, especially in those allergic to bee stings. Knowing the difference between arachnid species and their threat level will help you decide whether to evict these little guys, or allow them to earn their keep. One of the most beneficial arachnids to find in your home is also one of the most common. These common house spiders are part of a group called cobweb spiders and are responsible for those messy webs you find in the corners of a room. Barring an allergic reaction, they are completely harmless to humans or pets. You can identify an American house spider by the round abdomen; brown, tan, or grey bodies with darker brown markings, and the rounded abdomen. The largest can stand on a nickel. As a general rule, they prefer more quiet locations, such as the attic, basement, or a closet. However, they’re known to set up shop in a relatively undisturbed corner when there’s a better chance of food. Fresh (dust-free) cobweb was commonly used in Old World medicine to pack wounds. In recent years, it was discovered that the cobweb have analgesic properties and dissolves naturally as the wound heals. It just goes to show how some critters can be more beneficial than we think. The most notorious of spiders, black widows are actually far less deadly than their reputation suggests. 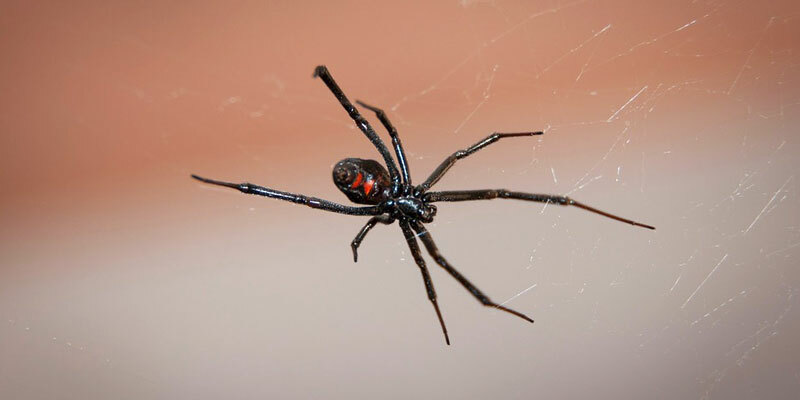 These arachnids are a glossy black with a bright orange to red hourglass marking on the abdomen. They get their name from the misconception that more aggressive females eat the male after mating. An effective anti-venom for a black widow’s bite was developed in 1956. Since then, it has become increasingly rare for a person to die from the widow’s “kiss” so long as treatment is sought quickly. As the venom is a neurotoxin, symptoms may include nausea, hypertension, headaches, abdominal pain, pyrexia, vomiting, or complications to any existing heart problems in even a healthy adult. 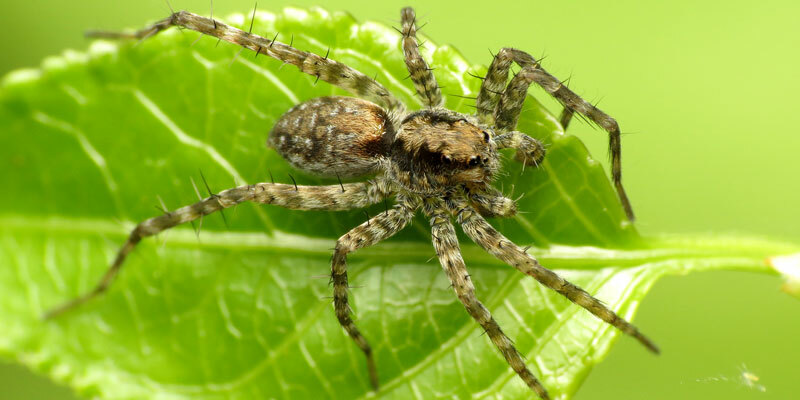 This highly dangerous spider has an established residence in 15 states. 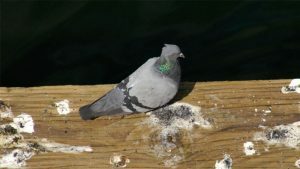 They have a brown or grey body, with an oval-shaped abdomen measuring about 1/3 inches in length, and three pairs of eyes. The most distinguishing feature, however, is the violin-shaped marking on their body. While not an aggressive species, they will bite when threatened. Eliminating clutter in storage areas and sealing cracks and crevices in your home will help keep them out. 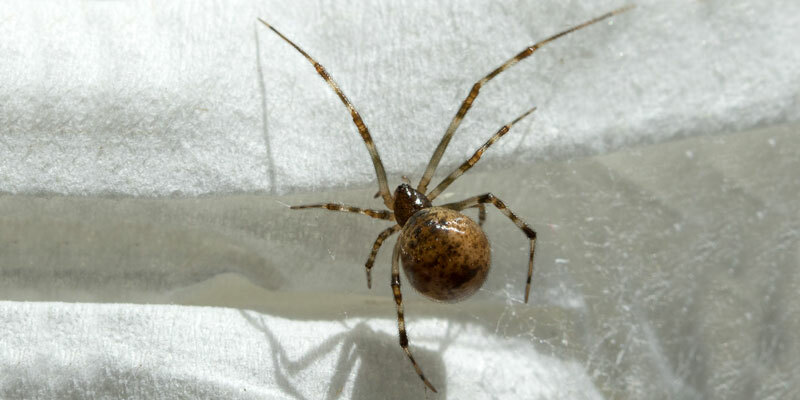 If you believe you or a household member has been bitten by a brown recluse, it’s vital to seek medical attention immediately. The cytotoxin in its venom can cause necrosis and tissue loss near the bite wound. In addition, a victim can suffer several other symptoms, such as fever, chills, nausea, rashes, and pain. A bite could prove life-threatening for children, the elderly, and pets. This aggressive species of arachnid has an oblong brown or tan body. 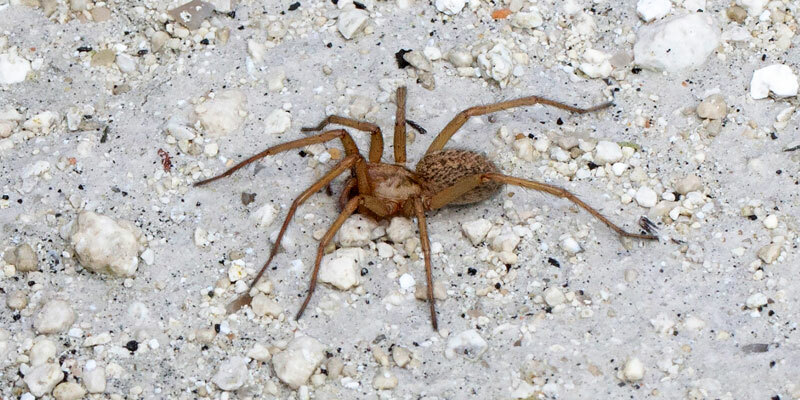 As they’re a similar size and color as brown recluse and wolf spiders, it’s easy to confuse them. They’re often referred to as funnel weavers, since their webs resemble funnels, and this can help distinguish them from other spiders. As with most species of invading spider, hobos aren’t particularly dangerous. 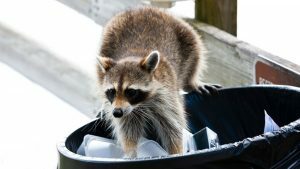 Their bite can cause irritation and may have a more pronounced effect on those with allergies or weaker immune systems. Because they’re more aggressive, you might want to remove this species to avoid a run-in with your children or pets. 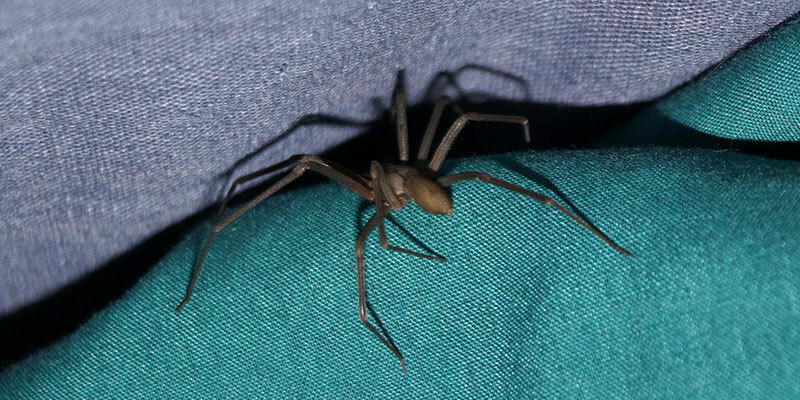 These diurnal spiders are well known for their ability to leave women (and many men) standing on chairs and screaming. Furry and only an inch long with longer front legs, their strange hopping movements and ability to jump when frightened give them this well-earned reputation. You can find these spiders in a variety of colors, ranging from beige, tan, or brown, to black or grey. 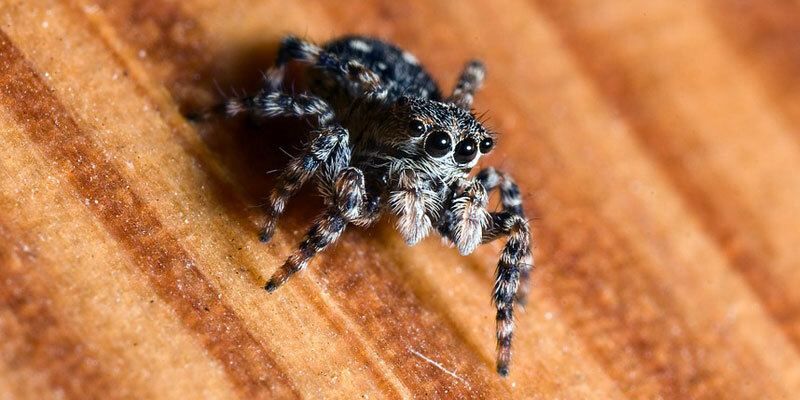 Unlike many other house-dwelling spiders, you’re most likely to find a jumping spider somewhere sunny, such as a window sill or bright corner. The bite of a jumping spider is very similar to a bee sting and has similar side effects. Children and those with spider allergies may have a more extreme reaction, however. These common house spiders are often mistaken for a daddy long legs, which isn’t actually a spider. 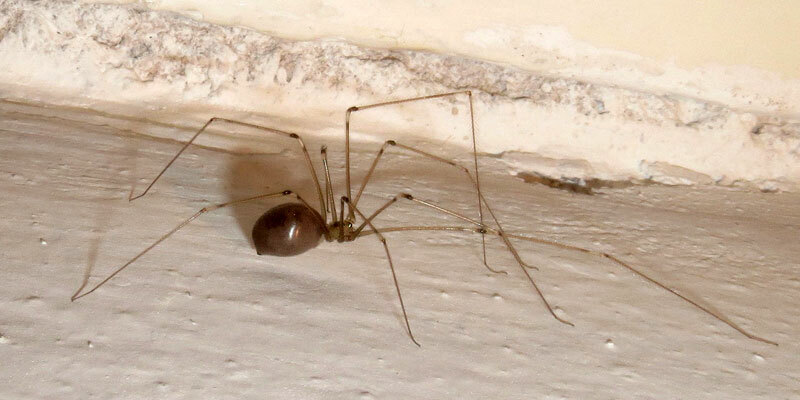 The long, thin legs are what causes this confusion, but the long-bodied cellar spider has two body segments as opposed to the daddy’s one. In addition, these guys have a round body and either brownish-tan, beige, or grey bodies. You’ll find these guys throughout the house, although they prefer dark and damp locations to build their webs. Cellars, garages, and crawl spaces tend to be their favorite haunts. While creepy, these spiders don’t bite and therefore pose the least threat to your household. These are the spiders most people think of first (especially if you know who Charlotte is). They spin beautifully ornate webs (unless drunk) and have large round abdomens. Their bodies have dark to light brown patterns and eyes set in two rows of four. 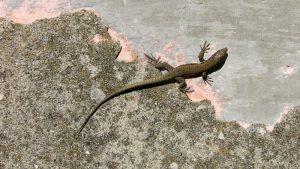 Non-aggressive and of no threat to humans, these guys can be a major benefit in the yard or garden. When they come in, however, they can be a nuisance and their clutch contains several hundred offspring waiting to greet you in the spring. While not a specific species, you’ll find these to be incredibly common house spiders. 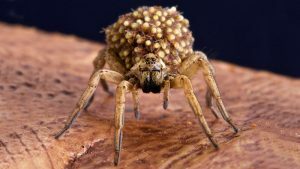 The group is so named because they lay their eggs in sacs and don’t spin webs. 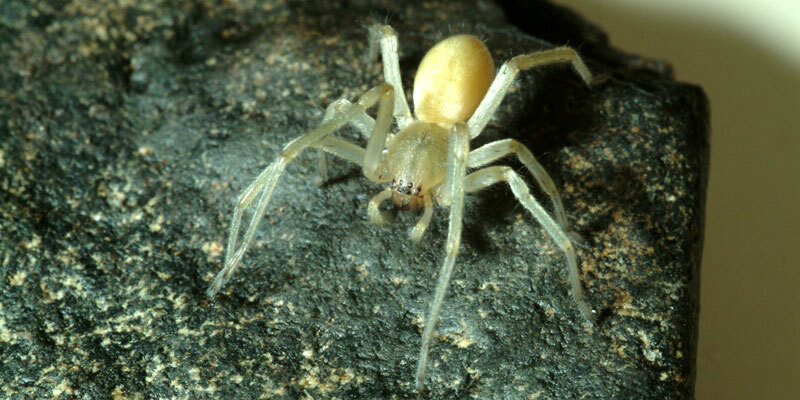 Yellow sac spiders are the most common household variety, although other light-colored species will also move in. They have small, 1/2 inch oval bodies and two rows of eyes. In general, sac spider bites produce a bit of swelling and irritation. Those with allergies can have more violent reactions. When you see a white silk egg sac in a corner or under furniture, be sure to check for a guarding female before removing. These large spiders are active hunters and can easily enter your home through small cracks. 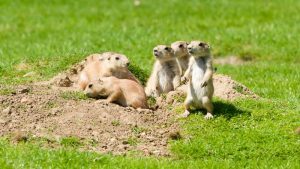 Their large bodies have furry legs and may be brown, black, tan, or greyish-beige in color. As they’re over an inch in length, they can seem quite intimidating. Wolf spiders will only bite in self defense, and the results can be quite painful but generally harmless. Those with allergies or weaker immune systems are more likely to have reactions to the wolf spider’s venom and should seek treatment. Oddly enough, wolf spiders make great pets and are quite popular among arachnid lovers. To learn more about the largest common house spiders, please check out our in-depth guide.